Love fried food? Also, love ‘eating healthy’? Say hello to your next best friend, an air fryer. Of course, with such a USP it doesn’t come particularly cheap but that doesn’t mean it’s not affordable. Don’t be surprised if in the next forty-fifty years, every house is equipped with one. Apart from the obvious health benefits, it’s easy to use and is ideal for all the busy moms out there. These, minimal space-consuming kitchen appliances have a long way to go in penetrating the Indian markets and with its benefits it looks like it’s just a matter of time before this happens. What to look for in air fryers? Features: When dealing with appliances like air fryers that are meant to make your work easier, its features prove to be a very important factor that must be considered. Its price should justify its features. Easy to use: Don’t buy an air fryer with ‘n’ number of features and use only the most basic one. Understand the features, understand how to benefit from these features and understand how to use the appliance. It’s of no use, unless you can reap all the benefits from it. Electricity Consumption: These air fryers work on electricity. Always opt for ones that utilize this non-renewable energy resource effectively and efficiently. Not only will it save your money, but you will be helping the society as well. Okay, now you know the benefits, you know what to look at. What’s left? Some real life products that you can purchase, if need be. So, here is a shortlist of five air fryers that might help you make a decision, when you need to. 2 years warranty., 1350 W.
"Fry" Food without or with little oil, Reduce Fat Intake up to 80%., Excellent Frying Result form Air Circulation Technology. Easy to Use, by Pushing and Pulling the Fry Drawer. Safe to Use and Clean, with Automatic On/Off Switch, Indicator Light. Ready Bell and Overheating Protector. 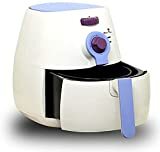 We have also picked our own choices to give you more idea and information about top air fryers in India.Check the below list and choose one that can best serve you. Let’s look at it’s features first. This model offered by Philips comes with adjustable temperature control, a timer, auto shutoff and with the best air frying technology to leave you with yummy and healthy food. Don’t know what to cook? Well, don’t worry. This model comes with a recipe book too. The power it consumes is 1425 Watts. Kenstar offers a three liter frying basket air fryer, that comes equipped with a thermostat and timer dials. It requires 1500 Watts of power and requires an operating voltage between 220-240 volts to function efficiently. You can make an aloo samosa or an upside down pineapple cake, the possibilities are endless. Quite an affordable option out there in the world of air fryers. This model by Lifelong comes with a lot of the features. From automatic shut off to being timer ready. It uses just 1350 Watts of power and the product comes with a thermostat, because of which you can cook food in temperatures as high as 200 degrees. Don’t worry, this too comes with a cookbook to help you make all the fatty delights 80% healthier. This product is one of the more sophisticated, top model, air fryers available out there available in the market. It comes with a 2 liter large food capacity and an extra 4 liter large pan capacity. You can cook more than one food item at a time, a feature which is quite unique. Apart from this, it has the standard features like an automatic timer and a temperature control function. This air fryer lets you reduce nearly 85% of the oil that is generally used. The primary material is aluminium, which gives the product a non-stick coating, to make cooking as well as cleaning the appliance a lot easier. Along with all these features, it’s easy on the environment as well, using just 1230 Watts of power. A step ahead of the above air fryer, this is probably the ultimate air fryer in this list. Apart from the standard features, it has a cord storage to keep your kitchen surface neat and tidy. It’s easy to clean, especially in a dishwasher as its parts are dishwasher safe parts. You can fry, you can grill and you can roast food as well. Despite all its features it uses just 1400 Watts of power. 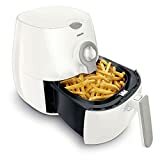 What makes this air fryer so unique is its design. Its design is which ensure super fast and healthy cooking which reduces the fat content while frying food by upto 80%. 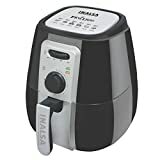 Hope the list of 5 best Air fryers mentioned here have helped you to select a good one for your kitchen.Do comment if you need any other help.